A growing customer and operator base plus an increasing business volume have prompted Airbus to create a new business unit, Airbus Corporate Jets, to better respond to this part of its business. The Airbus Corporate Jets unit will bring together commercial, programme and support activities in a single in-house unit. It will also have a direct link to the company’s Airbus Corporate Jet Centre cabin-outfitting subsidiary, part of a worldwide network of approved completion centres. “With almost 200 Airbus corporate jet sales to date, we now serve a growing and increasingly important community, and combining all the various aspects of this business will help us to serve our customers better while paving the way for further expansion,” says Airbus Chief Operating Officer, Customers, John Leahy. Airbus sold its first corporate jets in the mid-Eighties and, in 1997, launched a corporate jet version of its A319 airliner, now called the Airbus ACJ319. Today, Airbus offers the world’s most modern and comprehensive corporate jet family, ranging from the Airbus ACJ318 to the ACJ380, offering companies, individuals and governments the comfort they want in the size that they need. “Our corporate jet customers and operators already benefit from the features, reliability and support that we build into our modern airliner family, but we also recognise that they have different needs, and our more integrated Airbus Corporate Jets division will help us to address these even better and more responsively”, says Habib Fekih, President Airbus Corporate Jets. Airbus will also invest more resources in the Airbus Corporate Jets business unit, including the expansion of its local presence in key markets, and it will have more potential to launch improvements in both products and services. 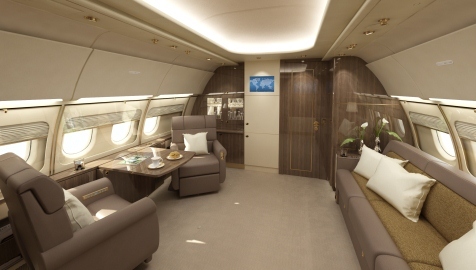 Airbus’ ACJ318, ACJ319 and ACJ320 are the new top-end of the large corporate-jet market, because their cabins are around twice as wide as those of traditional business jets, and because they are unmatched in the home and office comforts that they allow customers to take into the air. They provide this extra space and comfort within a similar aircraft length and wingspan to that of competing business-jets, and can also take off and land in similar distances. Airbus also offers VIP widebodies for customers that want to carry more people even further, delivering even more comfort and space, plus “nonstop to the world” capability. Airbus corporate jets are the only business jets flying on every continent, including Antarctica.